Speed Racer was the story of Speed, an 18 year old racing driver and his adventures on and off the track. On his helmet was printed M, originally standing for "Go Mifune" his original Japanese name. His girlfriend was Trixie, his younger brother Spritle, and Spritle's pet monkey was named Chim Chim. Speed's mechanic and best friend was Sparky. Speed's older brother was Rex, who also played Racer X- a masked racer with even Speed not knowing his real identity, and was an undercover agent. He had left home years ago and none of his family had seen him since. Speed's car was known as the Mach 5. It was designed and built by his father "Pops" and was equipped with incredible features, operated by 7 buttons on the steering wheel. Carloco (Stallone and Shwartzenegger) purchased the rights to do a live action Speed Racer. They paid $10 million for the rights. The script was finished and even hired a casting agency and cast the parts. After the failure of Cliffhanger and Last Action hero, nothing became of it and so their licenses have expired. Too bad. I would have enjoyed it (from Dave Stenberg). A new series titled "New series of Speed Racer" was produced by Fred Wolf films from Teenage Mutant Turtle fame and released in 1993, but was not as popular as the original, for a few reasons. 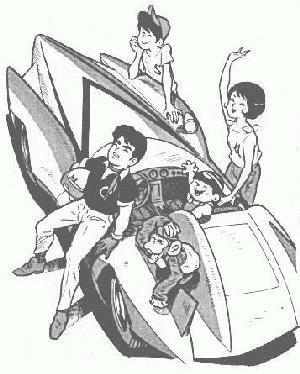 The animation was done by American cartoonists, losing that great Manga effect; the storyline and animation seems only to appeal to small children and not to adults as the original one did. The artwork is nowhere near as good and the theme song was changed. The only things remaining are the original names. A big disappointment! Now a live-action film is in production, starring Emile Hirsch, Matthew Fox, Christina Ricci, John Goodman and Susan Sarandon. Learn more at www.speedracerthemovie.com. The above description came from 60's Anime's, and was edited by yours truly (contact me).